The Summer of Letting Go by Gae Polisner. Review: Not even the ocean can drown our souls. That's the truth, I think. Not even. A depressed girl named Francesca has lost her younger brother and she believes that it's all her fault. In The Summer of Letting Go by Gae Polisner, Francesca takes you on a crazy ride of her gloomy, isolated, but possibly rescued life. It's been four years since Francesca's brother, Simon, drowned. Francesca believes that it is all her fault. Her mother is very depressed and her father has been strangely disappearing at times. Lisette, Francesca's best friend, tries to help Francesca by taking her to places to help her forget. There is a boy named Bradley, Lisette's boyfriend that Francesca adores. But, Francesca loves him so much that she wonders if anyone, even Bradley, would like her for what she has done. One day, Francesca meets a boy named Frankie Sky. As Francesca gets to know Frankie, she wonders if he may be Simon's reincarnation. Could Frankie Sky be Simon's reincarnation, if that's even possible? Read this outstanding book to find out! The Summer of Letting Go is a wonderful, romantic story. The setting of the beach and the salty water, the rain and the isolation, and the warm beating sun makes the setting give full feelings. I can somehow relate to Francesca because at times I would feel the same way she does about life. Francesca is a very unique character in many ways. She is someone who has lost a dear family member and she has gone through what many people never experience. 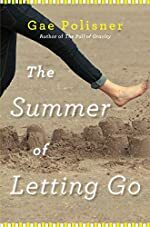 The Summer of Letting Go is a great book that is filled with suspense. For example, this quote shows that Gae Polisner's writing style is beyond comparison to any other writer. I take it and reach out to touch his arm, only to thank him, I think, and the next thing I know-I really don't know howÉ This is something that's suspenseful! What will happen? Read this romantic book to find out! This book would be great for children in 6th grade or older. The Summer of Letting Go begins slowly with sadness and loneliness. But then, the story gets exciting with action, romance, and suspense. The Summer of Letting Go is written in Francesca's point of view, and it can teach anyone that anything can happen. Things such as romance can show up at any time. Also, believe in yourself and never blame yourself for the big stuff. We would like to thank Algonquin Young Readers for providing a copy of The Summer of Letting Go for this review. Have you read The Summer of Letting Go? How would you rate it?